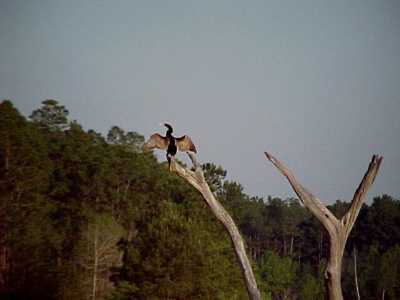 Launch: You could launch at Wingate Fishing Lodge on Lake Seminole, just above the Woodruff Dam and then lock down into the free-flowing river. Nearby campsites: There is also camping at Wingate Fishing Lodge. 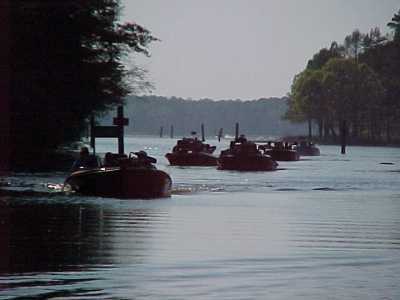 Comments: If you have insufficient time to do the entire trip from Eufaula to the Gulf, launch at Lake Seminole. 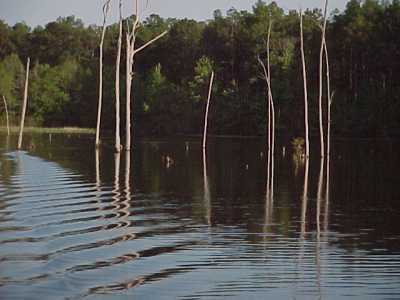 -----The Flint River is a tributary of the Chattahoochee and is navigable upriver to Bainbridge, Georgia. It must be a fine fishing river judging by the number of fishermen (human and feathered) we saw on the river. 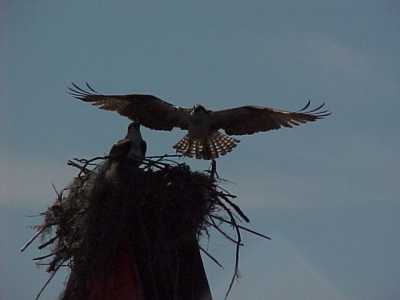 One can launch or lunch at the Lunker Lodge on the lower Flint at Wingate Fishing Camp. 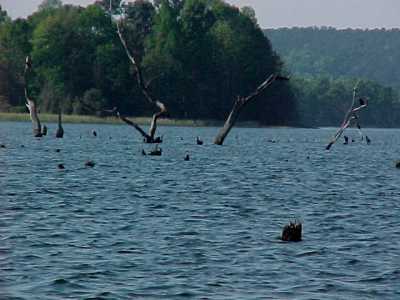 -----When the Army Corps of Engineers built the dam just below the junction of the Flint and Chattahoochee Rivers they impounded Lake Seminole. The lake flooded the valleys of both rivers. 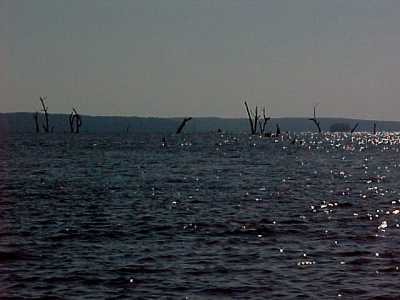 The drowned forests that bounded these rivers litter the lake as stumps, stubbs, and dead trees. 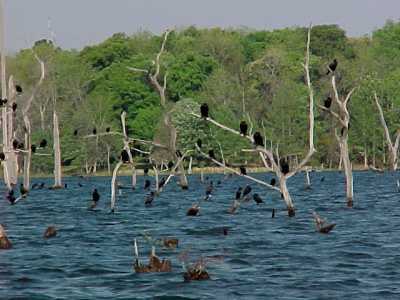 The fish that are attracted to live near these underwater tree remnants attract both human and bird fishers. 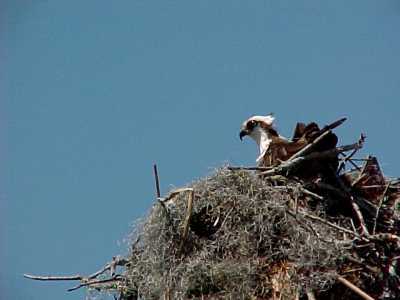 There are Ospreys nesting on many of the stubs or navigation marks. 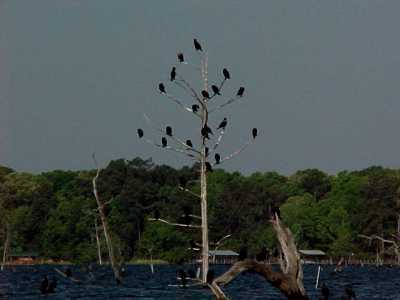 Cormorants perch on the stubble, resting between their fishing forays. 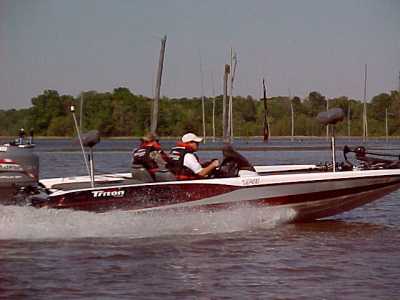 And bass boats are everywhere. It is a beautiful river. 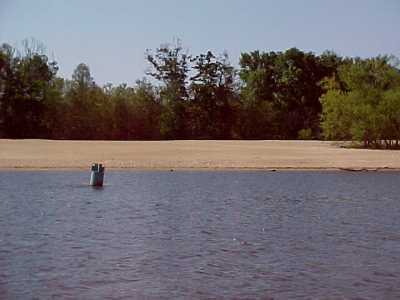 -----There are miles of "River Roads" marked in Lake Seminole along the Flint River. These water routes lead between the river and adjacent creeks. They lead to excellent anchorages, great fishing holes, good swimming beaches and some fine bird watching.